Far too many evenings of theater leave one hungry for mental nourishment. Then there are the plays of Tom Stoppard, who challenges the brain with heady subject matter and tickles the funny bone with audacious wordplay. Introduced to the world in 1966 with Rosencrantz and Guildenstern Are Dead, his deconstruction of Hamlet by way of Waiting for Godot, Stoppard was long criticized for being all mind and no heart. He silenced his skeptics in 1982 with The Real Thing, a cerebral and emotional outpouring about a playwright experiencing true heartache. Now, at adventuresome Palm Beach Dramaworks comes his 1993 play, Arcadia, a graduate level intellectual comedy with a full dose of feeling. One can imagine Stoppard brushing up on thermodynamics, mathematical algorithms, chaos theory and 19th-century gardening tenets, then posing a puzzle to himself as to how they could all fit into a single cohesive storyline. Well, make that two storylines, for he takes a page from Alan Ayckbourn and sets his play, sequentially and later simultaneously, in an English country house in 1809 and today. In the earlier time period, rakish tutor Septimus Hodge (Ryan Zachary Ward) is presenting a lesson to his 13-year-old charge, the precocious and whip-smart Thomasina Coverly (Caitlin Cohn). 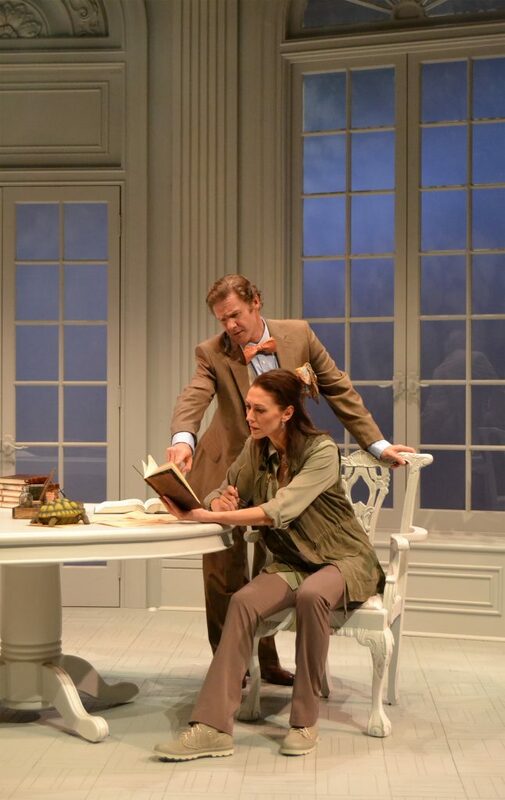 The nature of academic pursuits weighs on Stoppard’s mind, for when the play shifts it focuses on a couple of contemporary scholars – arrogant Bernard Nightingale (Peter Simon Hilton) and bookish Hannah Jarvis (Vanessa Morosco) – both researching events 200 years earlier and reaching erroneous conclusions. Still, Stoppard sides with the academics for their seemingly rational efforts. Nor does Stoppard restrict his canvas to this handful of characters. Arcadia calls for a cast of 13, which may account for the play’s relatively few productions as much as its heady content. Swirling around the early 19th-century teacher and pupil is a hack poet, Ezra Chater (Cliff Burgess), whose wife is having an affair with Hodge and who may or may not have been killed later in a duel with Lord Byron. And then there’s the highstrung matriarch of the estate, Lady Croom (Margery Lowe), a landscaper (James Andreassi), starchy Capt. Brice (Gary Cadwallader) and a lowly butler (Dan Leonard). The present day scenes are populated by various latter-day Coverlys – Valentine (Britt Michael Gordon), who has romantic designs on Hannah, young Chloe (Arielle Fishman) and the mostly mute Gus (Casey Butler). At the core of Arcadia is a mystery about the sudden disappearance of Chater and Lord Byron’s potential implication in his demise. But Chater is never seen as more than a buffoon, whereas Thomasina is clearly touched with genius and hearing of her young death is met with genuine remorse. 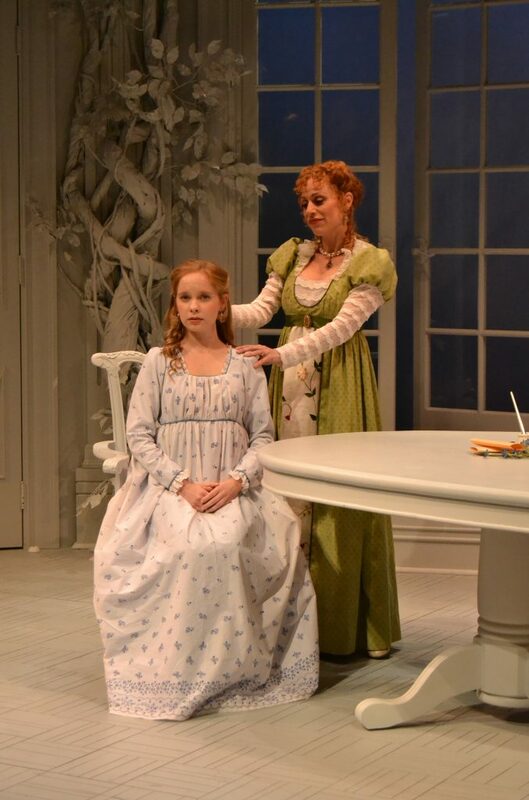 As Thomasina, Cohn gives a remarkably poised performance, as skilled beyond her years as her character is sage. Ward is aptly charismatic and virile as her tutor, Hodge. Still, the 1809 scenes seem to take a backseat to the contemporary narrative, in large part because of married-in-real-life Hilton and Morosco, whose barbed banter is wholly persuasive and delicious fun. Dramaworks’ resident director J. Barry Lewis renders the densely packed text with admirable clarity. Still, at three-and-a-quarter hours, the production demands mental (and physical) stamina from its audience. I cannot say that I understood all of Arcadia, but more of it sank in this time than my two previous encounters with the play in New York. You may occasionally yearn for a pause button, to halt the play and contemplate the ideas that keep pouring out. But even if a few passages elude you, there is much to take in and chew on in this feast of ideas. ARCADIA, Palm Beach Dramaworks, 201 Clematis St., West Palm Beach. Through Sunday, April 30. $66. Call: 561-4042.